Who will it be? Ken or Kim. Why spend your weekend with an old British guy, instead of trolling Kim Kardashian on Instagram? He’s a lot funnier than he looks and he’s been knighted by the queen, which is kinda cool. Ken Robinson is also an advocate for passion and creativity. Kim’s an advocate for selfies and…well…selfies. Why are your parents and teachers all excited about this event that they aren’t even invited to? Well, it’s a safe space for you to express the ideas you love, get messy with being creative, and get fired up to change the world. Your parents and teachers are likely a little envious that they never had an opportunity like this. You have unique gifts to share. Don’t sell yourself short. You may know what they are, and you may not. Yet. When you get together with other like-minded people, ideas could turn into a project, a business or even a movement. Build on it, inspire others or contribute to your school or community. The Rethink Thinking theme this year is a movement that brings people together to look at things a little differently. It’ll give you the tools to change your community, and even the world. Being inspired to make change happen is fun. Breaks from exploring your ideas are necessary. Inspired ideas and creative expression come from the energy we get when we goof off a little. Inspiration comes in all forms, and we consider FUN one of the highest forms of expression. A “creativity is messy” collaborative activity that involves everyone at the Summit, loud music, an explosion of colour and a lot of movement! Let’s just say, you’ll likely want a change of clothes. A student-led music and light show where you can listen and chill or shake it like it’s 1995, if that’s your jam. Tasty local food trucks and lots of FREE snacks available to keep you fueled. 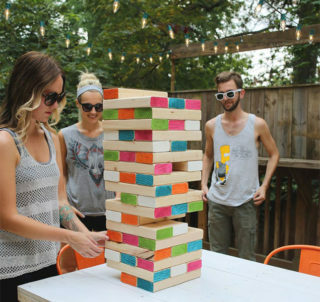 GIANT outdoor Jenga and other games to keep your ideas flowing. An inflatable photo booth for capturing exciting moments with friends. For those who want to take your ideas even further, you can continue with the Summit community after the event! Ongoing collaboration opportunities with the over 50+ mentors from science, arts, business, sports, politics and international backgrounds. An open invitation to participate in exciting post-event opportunities to keep your vision moving forward. A “Doing It Differently” Award from UVIC’s Peter B. Gustavson School of Business for an individual or team. An opportunity to take your project beyond idea and into reality with hours of support from Gustavson School of Business’ Innovation Centre for Entrepreneurs. The connections and friendships that you’ll make at the Summit will help you build your future with the support and connections you need to realize your dreams. We hope you’ll join us for this action packed and inspiring weekend! The possibilities are endless and the best part is that anything can happen!